Each of the Reformers had something to say about the Mass. In 1520, Martin Luther’s A Treatise on the New Testament, That is the Holy Mass was a key publication among several he wrote on the subject. Ulrich Zwingli was the leader of reforming work in Zurich and he held to a different view of the supper than Luther which led to their exchanging some occasionally heated words and some publications on the subject. Reformer and Bible translator William Tyndale of England wrote a treatise in response to publications in support of the Mass written by Henry VIII’s lord chancellor of England, Sir Thomas More. John Calvin entered the reforming scene too late for the Marburg Colloquy (1529) and its discussions regarding the Lord’s Supper between Luther, Zwingli, and others, but he wrote regarding the supper in his Institutes of the Christian Religion along with a number of other selections from his writings. Also, the Scot, John Knox, Calvin’s friend who was an exile for a time in Geneva, was particularly effective with respect to his work challenging the Mass. Three major interpretations of “this is my body” developed within Protestantism. The first is associated with Martin Luther and is known as the real presence. 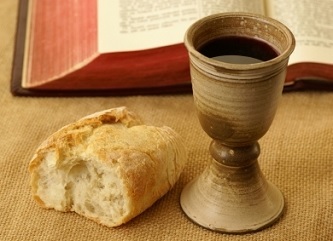 For Lutherans, Christ is said to be present “in, with, and under” the bread and wine. The second view is that of Ulrich Zwingli who initially held to a memorial understanding in which he viewed the elements simply as reminders of Christ’s sacrifice much as a memorial plaque will remind readers of the deceased person it commemorates. It seems, though, that Zwingli’s view evolved and at the time of his death his understanding involved some sense of the spiritual presence of the Lord. The third interpretation is the Reformed understanding associated primarily with John Calvin who said Christ is spiritually present and the Lord’s Supper is a means of grace in that the physical elements accompanied by the ministry of the Word strengthen and encourage worthy partakers through faith. An associated emphasis of the Reformed view is the importance of the preached word accompanying the administration of not only the supper but also baptism. Fellowship Presbyterian Church subscribes to the Westminster Confession of Faith and its catechisms which essentially follow the teaching of Calvin. It may help to visualize how the three Protestant views and the Catholic interpretation relate to one another in terms of the Lord’s presence in the supper. Imagine a horizontal line segment showing from left to right the degree of the Lord’s presence in his supper with the greatest presence at the right end and the least at the left. The Mass is at the right end because Christ is said to be physically present, while Zwingli’s view would occupy the left end with its memorial or modified memorial sense. Luther’s view would then be on the line closest to the Mass end and Calvin’s spiritual-means-of-grace presence would be closest to Zwingli’s end. As the Reformation progressed and the sixteenth century unfolded the three views continued to be held and tweaked in their finer points. Protestants were united in their opposition to the Mass, but they could not come to an agreeable common view of the Lord’s Supper. The papacy took advantage of Protestant disunity and in 1562 reaffirmed clearly and concisely the Catholic doctrine during the Council of Trent saying, “in the Mass, the same Christ who offered himself once in a bloody manner on the cross is contained and is offered in an unbloody manner.” That is, the mystical true physical presence of Christ in the bread and wine and the sacrifice of that body and shedding of its blood in the Mass was and is the authoritative teaching of Rome. The debate regarding the meaning of “this is my body” presents a sad irony. The Lord was giving his church a tangible and simple sacramental meal indicative of spiritual truth and grace. Tangibility is provided in baptism with ordinary water and in the Lord’s Supper it is experienced with the bread and the fruit of the vine. When Jesus broke the bread and served the wine to his disciples in what was the last Passover and first Lord’s Supper, he was thinking of the frailty of his followers and their need for encouragement in grace. In the history of the church, theologians had over analyzed the Bible’s texts that describe the supper and read meaning into them via Medieval logic and philosophy to develop the Mass and complicate the sacrament Jesus instituted in simplicity. The Reformers were not immune to philosophical influences, but sola Scriptura provided their anchor as they reinterpreted hoc est corpus meum and the meaning of the Lord’s Supper.